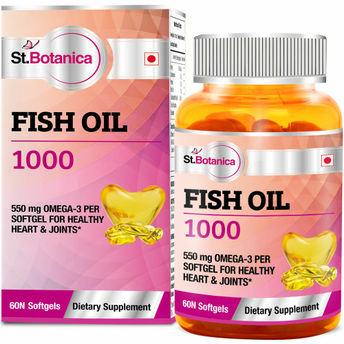 St.Botanica Fish Oil 1000 mg contains omega-3 essential fatty acids including eicosapentaenoic acid 330mg (EPA) and docosahexaenoic acid 220mg (DHA). It provides the required dosse of 550 mg of daily Omega 3. A famous TV expert calls Omega 3 the most important single supplement. with this product, you will meet his recommendation of 550 mg Omega 3 per day - with a single softgel! BETTER ABSORPTION & AVOID FISHY AFTERTASTE - Enjoy Health Benefits without Fish Burps! Each Soft gel yields 1000 mg Fish Oil Containing 330 EPA, 220 DHA comprising 550 mg Omega 3. Explore the entire range of Omega Fatty Acids available on Nykaa. Shop more St.Botanica products here.You can browse through the complete world of St.Botanica Omega Fatty Acids .